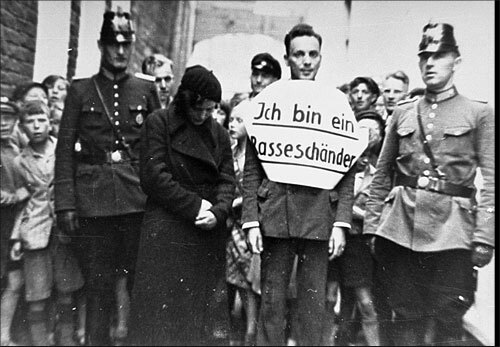 Public humiliation: "I am a defiler of the race"
In this photograph, a young man who allegedly had illicit relations with a Jewish woman is marched through the streets for public humiliation. Flanked by German police officers, he wears a sign that reads, "I am a defiler of the race." These events were calculated to both punish the so-called offenders and to make a public example of them as a deterrent to others who might not fully subscribe to Nazi racial theory. Norden, Germany, July 1935.